The Counter-Terrorism Studies Program combines academic study, simulation models, workshops, and onsite briefings. The courses provide concentrated, in-depth exposure to the phenomenon of modern terrorism and its characteristics, modus operandi, scope and dissemination throughout the world. In addition, participants will obtain an understanding of the challenge this phenomenon presents to decision-makers, security establishments, first responders and the business sector, based on the experience Israel has accumulated in the field. Circumstances have forced Israel to develop sophisticated counter-terrorism strategies and techniques and to amass extensive knowledge regarding terrorism. The program will allow participants from around the globe to benefit from Israel’s experience and advanced international counter-terrorism efforts. For the past decade, the Lauder School of Government has been offering courses on terrorism, counter-terrorism and homeland security. 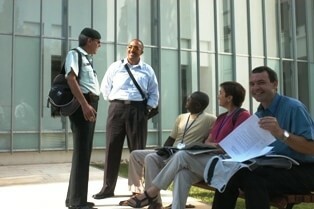 These courses are taught by leading international scholars and Israeli security professionals from the ICT. Prof. Boaz Ganor, Founder and Executive Director of the ICT and Dean of the Lauder School of Government, is the program’s director. The Counter-Terrorism Studies Program combines academic study, simulations, workshops and on-site brie­fings. The course provides concentrated, in-depth exposure to the phenomenon of modern terrorism and its characteristics, modus operandi, scope and dissemination throughout the world. In addition, participants will obtain an understanding of the challenge this phenomenon presents to decision-makers, security establishments, ­first responders and the business sector, based on the experience Israel has accumulated in the ­field. Circumstances have forced Israel to develop sophisticated counter-terrorism strategies and techniques and to amass extensive knowledge regarding terrorism. The program will allow participants from around the globe to benefit from Israel’s experience and advanced international counter-terrorism e‑orts. The Counter-Terrorism Studies Program will be taught in English over a three-week period during July 7-26, 2019. It includes six graduate level courses delivered by top experts from Israel and abroad, who are among ICT’s senior researchers and associates. Each course consists of 20 academic hours taught over a concentrated period of a week.